Share your good taste — or keep it all to yourself — with this tower of moist, delicious rum cakes. Baked in the Caribbean with only the finest ingredients, they'll lend a flavor of the exotic to everyone lucky enough to get a bite. Contains or may contain eggs, milk, wheat, soy, walnuts, coconuts, peanuts and tree nuts. Ingredients: RUM CAKE INGREDIENTS: Sugar, whole eggs, butter, wheat flour, water, soy and/or corn oil, skim milk powder, egg white powder, modified potato startch, baking powder, modified wheat and corn starch, TORTUGA Gold Rum, baking powder, salt, dicalcium phosphate, sodium aluminum phosphate, mono diglycerides, calcium sulfate, acetylated monoglycerides, gum arabic, caramel color, mono and diglycerides, artificial and natural flavors,polysorbate 60, xanthan gum, guar gum, yellow #5, yellow 6. Less than half of 1% alcohol. 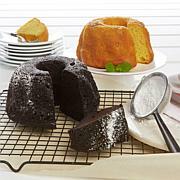 CHARACTERIZING INGREDIENTS: The following "characterizing ingredients" are present at less than 1% by weight: Original cake contains walnuts, banana cake contains banana, coconut cake contains coconut, pineapple cake contains pineappleand pineapple juice, key lime cake contains keylime juice and concentrate, chocolate cake contains dutched cocoa, coffee cake contains coffee concentrates from Jamaica coffee beans. Ingredients: Sugar, whole eggs, butter, wheat flour, water, soy and/or corn oil, skim milk powder, egg white powder, modified potato startch, baking powder, modified wheat and corn starch, TORTUGA Gold Rum, baking powder, salt, dicalcium phosphate, sodium aluminum phosphate, mono diglycerides, calcium sulfate, acetylated monoglycerides, gum arabic, caramel color, mono and diglycerides, artificial and natural flavors,polysorbate 60, xanthan gum, guar gum, yellow #5, yellow 6. 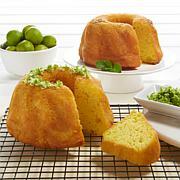 CHARACTERIZING INGREDIENTS: Original cake contains walnuts, banana cake contains banana, coconut cake contains coconut, pineapple cake contains pineapple and pineapple juice, key lime cake contains keylime juice and concentrate, chocolate cake contains dutched cocoa, coffee cake contains ground coffee beans. 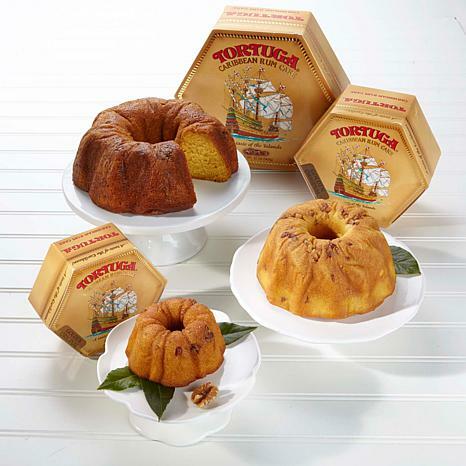 Love these cakes, my sister and I took a trip to Jamaica two years ago and we went to the store that sold these cakes. Needless to say we bought some home with us. 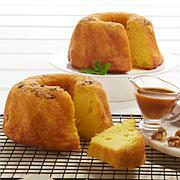 I was so happy to see HSN selling the rum cakes, they are so good. Nice moist cakes. Taste is delicious, nicely baked. Very strong but I love them. We opened the tiny one just to see what we thought. Well, we loved it. Very moist but strong rum taste. But I love rum so not a problem. Opened the next biggest size the week before Christmas and just finished it a day ago. No difference in taste, freshness or texture. That leaves the biggest one for last. They say it has a long shelf life so will hold off on it. Had thought I would give away one or more. Nope! Remind me about Tortuga upcoming shows.